This is where we look at things that happen in radio, video, on the web and such. 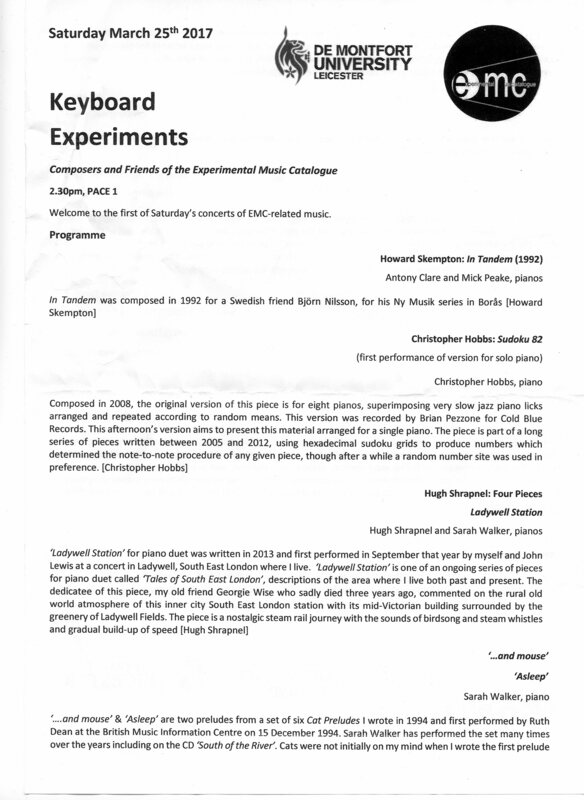 First, Carole Finer, Magic Carpet, and Cornelius Cardew, “Little Flower of the North” (from Schooltime Compositions), performed by the South Leicestershire Improvisors Ensemble (Lee Allatson, drums, Virginia Anderson, clarinets, Bruce Coates, saxes, Chris Hobbs, piano, Rick Nance Tibetan bowl and other instruments). 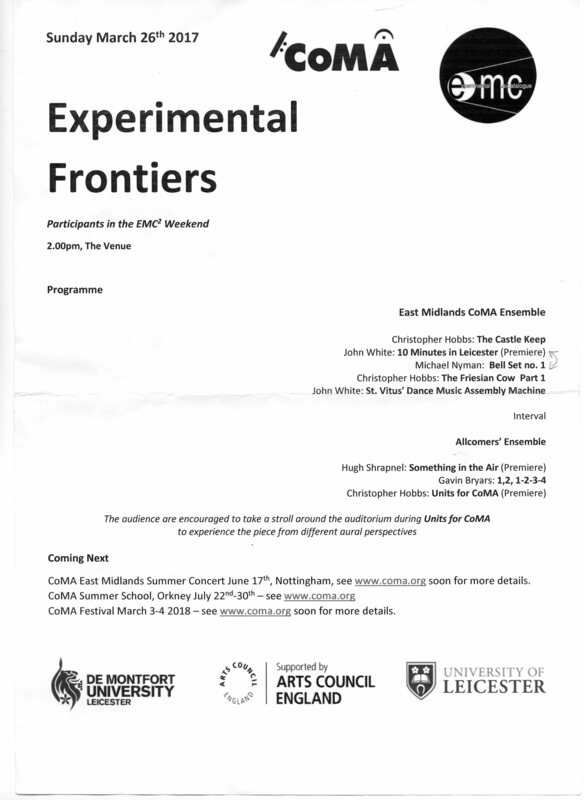 After a welcome and rehearsals in the morning, there was the Experimental Frontiers concert, consisting of performers from all the events through the weekend. 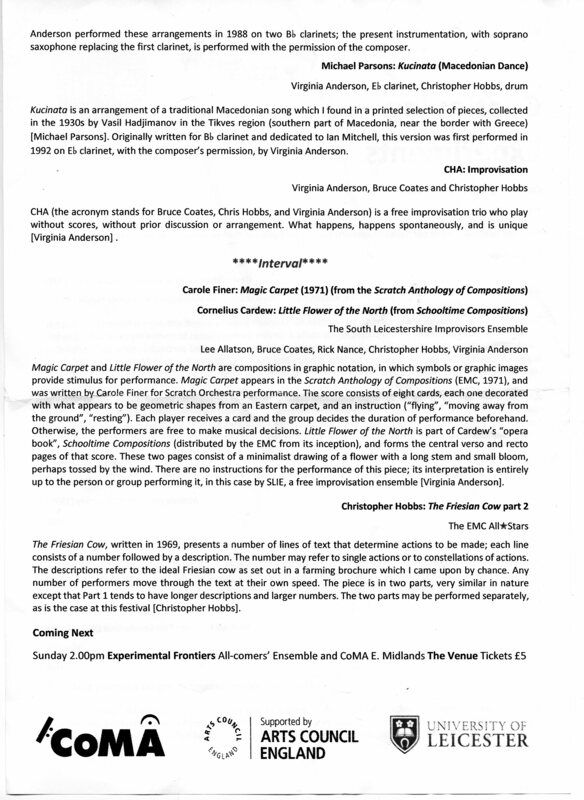 and the second half, which includes a video greeting from former EMC committee chair, Gavin Bryars, which wrapped up the approach and ethos for the festival, as Virginia Anderson’s talk began it. Thanks to Kieran O’Riordan, Anna Claydon for putting the EMC² Festival on; to James Thompson and his team of technicians at DMU for fantastic lighting and sound (check out the final piece, Chris Hobbs’ CoMA Units, for an example of their work); to Rui and Conner at the University of Leicester for their roving and fixed video work; and to Lee Allatson for HD video on Saturday night. And, of course CoMA, and everyone who took part. It was an amazing weekend. 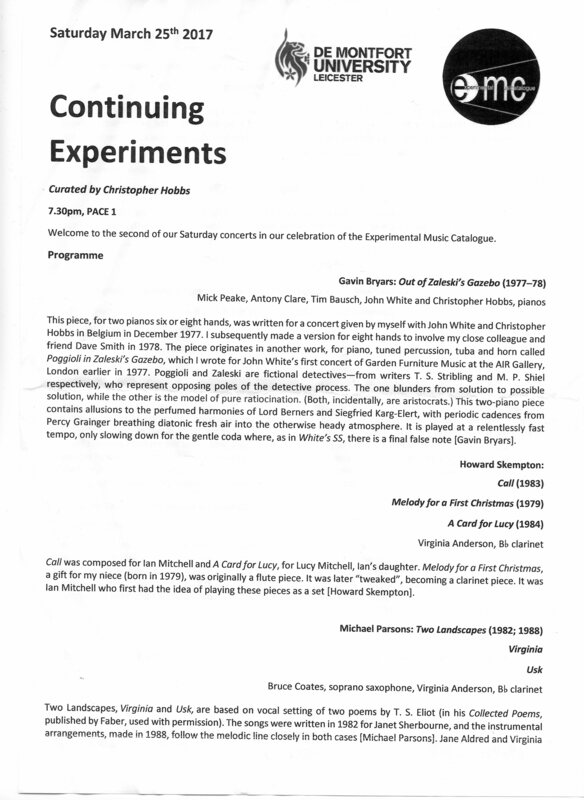 Here’s the revised schedule for the concerts for EMC²: Remembering the Experimental Music Catalogue. 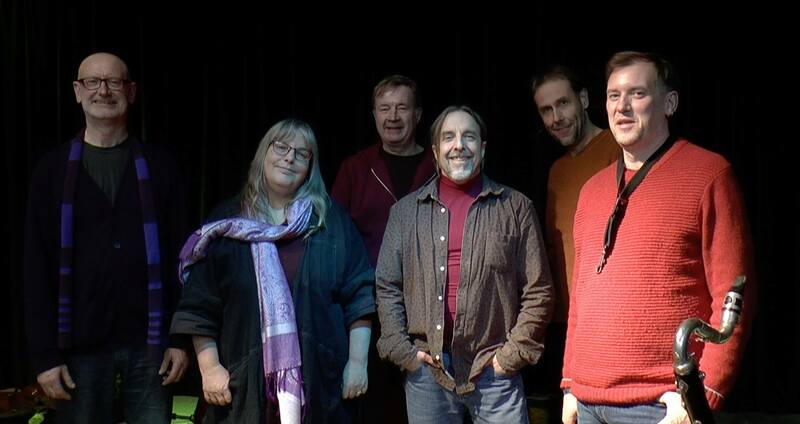 The new version includes some of Terry Jennings’ pieces from the EMC Keyboard Anthology. If you like English experimental, systems, minimal and postminimal music, this is THE weekend! 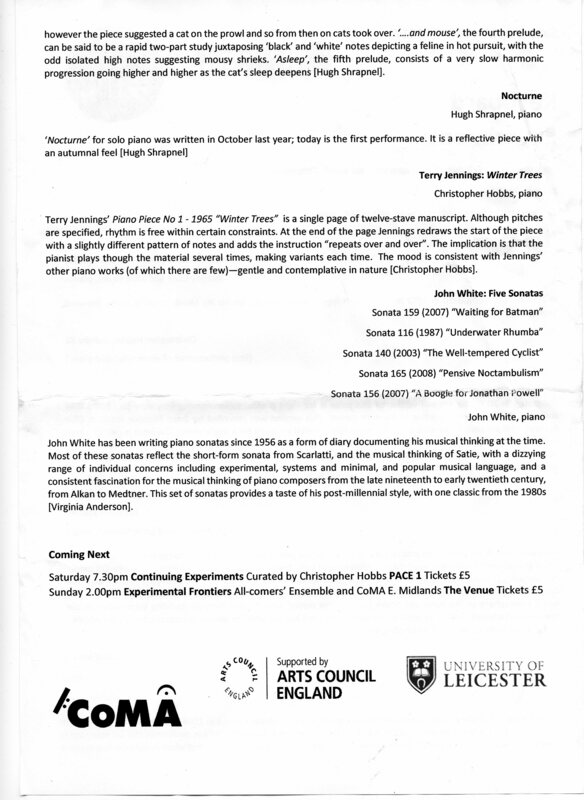 The big, grand, gala event will be the post-lunchtime (2 pm) COMA and all-comers concert of music by Hobbs, Shrapnel, Dave Smith and John White (new commissions) and by former EMC committee members Gavin Bryars and Michael Nyman, performed by a wide group of players from DMU, COMA, and guest stars. We’re absolutely, positively thrilled to announce a new Bandcamp issue from the EMC. Dave Smith has allowed us to release two tracks. The first, Moderation in Nothing (1976, EMC-113), is a classic archive recording, featuring members of two of the great British systems music duos of the 1970s, playing together as a quartet: Howard Skempton on sopranino recorder and electric piano; Dave Smith on ocarina and guitar; Michael Parsons, on electric organ and cymbals; and on wine glasses, bell and voice. It appears in its premiere recording at the Institute of Contemporary Arts, London, 31 October 1976. This extended-play track (over 23 minutes!) costs £3 (although you can give more) on our Bandcamp site. The other track, Frivolous and Vexatious (2002, revised 2014; EMC-114) was first written for Dave Smith’s 8th Piano Concert and is dedicated to the composer and former Garden Furniture Music member Ben Mason. It is heard here in the premiere of the revised version, at Schott’s recital room, London, 25 July 2014. This even-more-extended-play track (over 34 minutes!) costs £3 (although you can give more) on our Bandcamp site. So whether you’re frivolous, vexatious, or believe in moderation in nothing, it’s worth checking out these tracks for a free listen, and perhaps buy these goodies. We’ve migrated to a sleeker and more economical Bandcamp page just last week, but we still need support to keep this feature going. 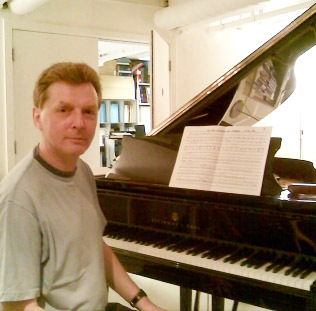 And for information, do check out Dave Smith’s composer page on this site for more information!